Elevated Work Platform (EWP) are the name given to a variety of platforms that provide a safe option when working at heights. Scissor lifts and boom lifts are types of EWPs. Some are designed to be operated only on level surfaces whilst others can be operated on rough terrain. Operators of boom-type EWPs with a reach above 11 metres must hold a ‘licence to perform high risk work’ endorsed with the competency. 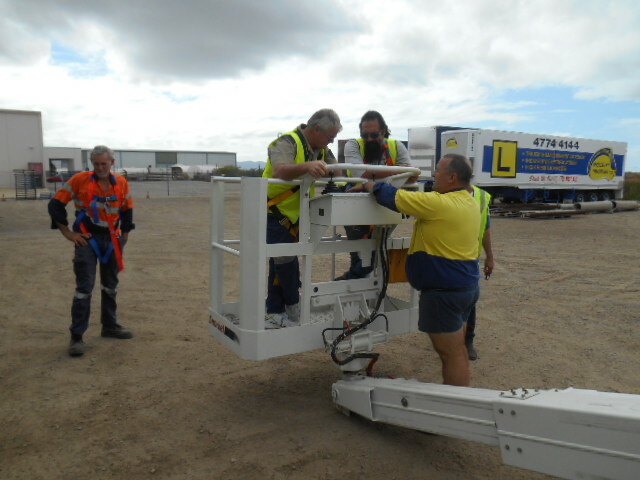 All hired access equipment must arrive on site with an operator’s manual and a log book. Do not operate a EWP without completing a pre-start check. Appropriate emergency procedures are required: ~ Emergency descent switches should be identified and tested prior to operation ~ Ground controls and descent valves should be known by all personnel. Care must be taken when working near power lines. A harness must be worn at all times in boom-type EWPs. Do not operate a EWP if you have not been trained in the safe use of the machine. Select the most appropriate EWP for the task. Never enter or leave the platform when it is elevated. Remain within the confines of the work platform at all times. Do not stand on the handrails of the platform. EWPs must not be used as a crane or hoist. Do not operate a EWP on uneven or uncompacted ground.